This is the 2nd edition of a very well received and popular book that reflects the current state-of-the-art of the ongoing research avenues concerning the hippocampus and processing units bridging the gap between single cell activity, network activity and global brain function. It aims to provide a methodology to anyone interested in developing microcircuit level models of the hippocampus. The book is divided into two thematic areas: (I) Experimental background and (II) Computational analysis. In part I, leading experimental neuroscientists discuss the morphological, physiological and molecular characteristics as well as the connectivity and synaptic properties of the various cell types found in the hippocampus. Behaviour-related ensemble activity patterns of morphologically identified neurons in anesthetized and freely moving animals provide insights on the function of the hippocampal areas. In part II, computational neuroscientists present models of the hippocampal microcircuits at various levels of detail (e.g. single cell level, network level, etc.). Synaptomics and connectomics models of hippocampal structures are initially discussed. Then, network models of memory, rhythm generation and spatial navigation are presented, followed by abstract and biophysical models of synaptic plasticity. Network models of hippocampal implicated disorders (epilepsy and schizophrenia) are then detailed and how their network topologies, connectivities and activities change in these diseases. Finally, two chapters are dedicated to describing simulator environments of single neurons and networks currently used by computational neuroscientists in developing their models and modelling tools to parametrically constrain them. 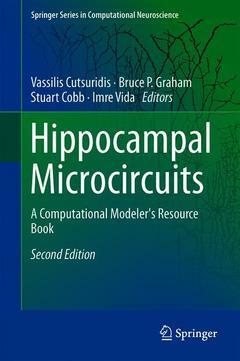 This engaging volume is invaluable to experimental and computational neuroscientists, electrical engineers, physicists, mathematicians and others interested in developing microcircuit models of the hippocampus. Graduate level students and trainees in all of these fields can find this book a significant source of information.